With age come wisdom and an abundance of not-too-exciting health concerns. One such concern is spider veins, and although they’re not dangerous, these veins are unappealing to the eye. However, they’re excessively familiar. An estimated 60% of adults are impacted by spider veins as they age. Why Are They Called Spider Veins? 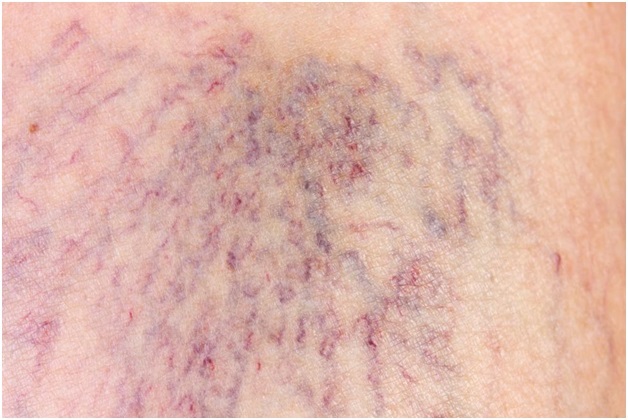 The scientific term for this condition is Telangiectasias, and it is often also referred to as varicose veins. The reason behind this unique name is the fact that many clusters of tiny blood vessels form close to the surface of the skin, and cause the veins to form a web similar to that of a spider. While many people might be unaware of the fact that they have spider veins, they’re relatively easy to recognize. These veins are often red, blue or purple and are not easy to miss. They usually affect the legs and spread throughout the thighs to the shins or ankles. Although both genders are susceptible to developing spider veins, they are commonly seen in older women. As aforementioned, spider veins aren’t dangerous in the initial stages, but a significant delay in treatment can cause further health complications as a result of the condition.In addition to the spider web type patchwork,sufferers of spider veins also experience tired legs, swollen legs or legs that feel heavy. Prolonged treatment may also cause spider veins to excrete puss overtime. Spider veins can be removed easily by seeking treatment from a trained professional, while also making lifestyle changes to become healthier. Sclerotherapy:One of the most common treatments of spider veins, sclerotherapy is known for its undeniable efficacy. In this treatment, a solution is injected into the affected vein, forcing it to collapse and halt blood flow to that vein.As a result of this, the vein turns into a scar and after a few weeks, fades away. Sclerotherapy has a 50% to 90% success rate depending on the severity of the condition in the said patient. Laser Treatments:Laser treatment is also one of the most effective treatments of spider veins because it manages to remove even the minutest of veins that cannot be injected with the solution used in Sclerotherapy. Although Sclerotherapy is relatively more common than laser treatment, both of thesehave the same success rate. Spider veins aren’t bothersome for every person. Some people have it their whole life without any complications. If they become painful or ignite other effects, such as swelling or tiredness in legs, then treatment is crucial to good health.